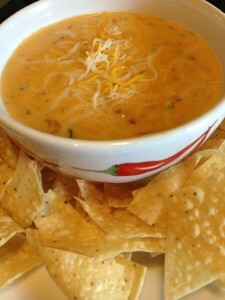 Chile Con Queso with Smoky Chipotles. 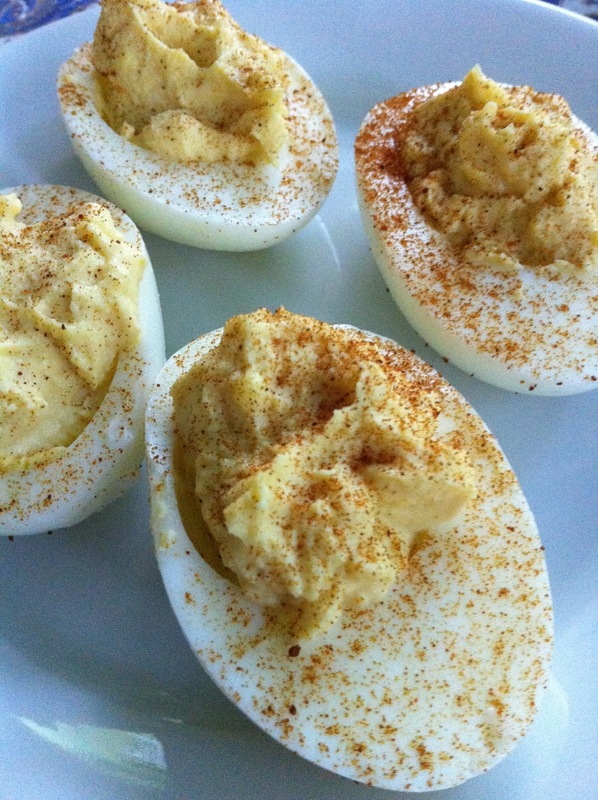 Smoky, spicy, cheesy, velvety goodness…. 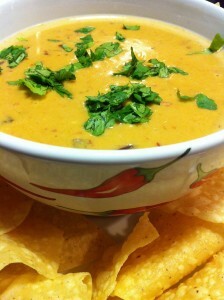 For a housewarming party, I served this kicked-up Chile Con Queso dip with fresh crispy tortilla chips. The guests clearly loved this rich gooey dip because it disappeared very quickly. 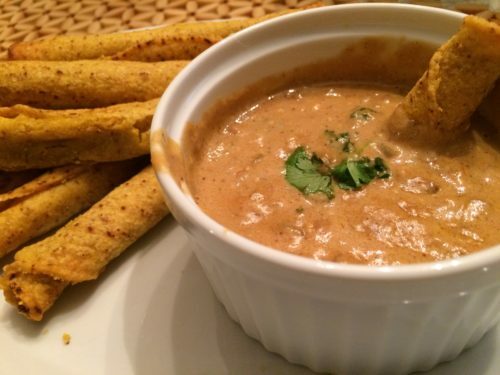 This dip is NOT a low calorie or low fat dish! It’s a treat once in a while. 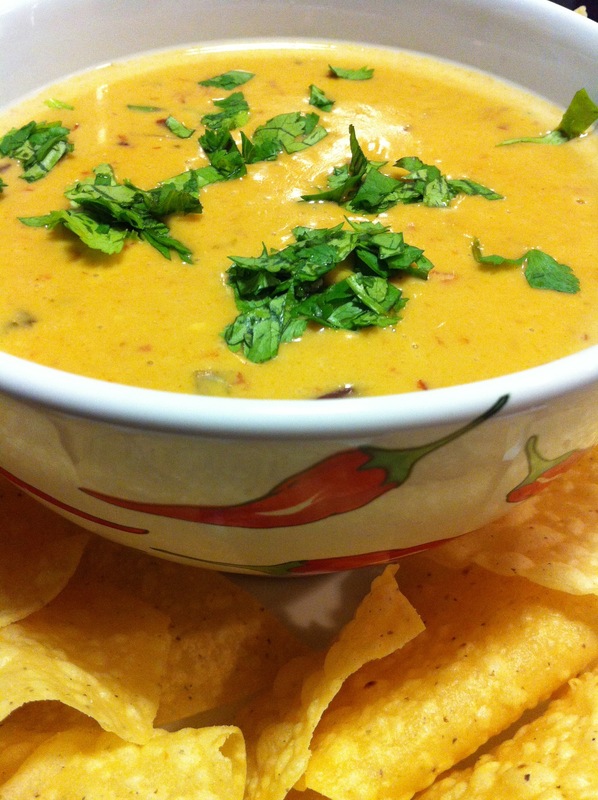 Set up the Chile Con Queso dip in a chafing dish on your party buffet for best results. This is one of my go-to party dishes. Get yourself a chafing dish similar to mine by clicking on the image below. You can purchase chipotle chiles in adobo sauce at your local grocery store. Drizzle this Chile Con Queso over tortilla chips and add guacamole, sour cream, shredded cheeses, and diced tomato for a hearty Nachos Platter! 1. In a saucepan over medium high heat, simmer the beer until it reduces by half or more. 2. Add the onion and sauté in the beer until onion is soft and transparent. 3. Add the tomatoes and green chiles and sauté until the liquid is almost gone. 4. Reduce heat to medium low, and slowly add small portions of the cream cheese or queso blanco, Monterey Jack, and cheddar cheeses. 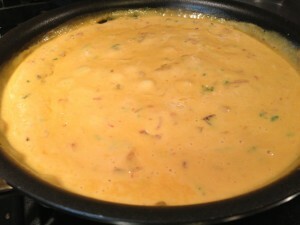 Stir the queso dip after each addition of a small amount of cheese until that portion melts and then add more cheese. Stir often until the dip is bubbling slightly. Keep watch as it may burn/brown on bottom. 5. Stir in the minced Jalapeno pepper, minced chipotle chiles, chili powder and chopped cilantro. Warm a few more minutes. 6. 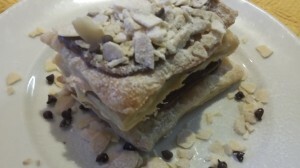 Add milk or cream if the consistency is too thick. Add more shredded cheese if it’s too thin. 7. Pour into a candle or Sterno-fuel-fired chafing dish to keep warm for a party crowd. 8. 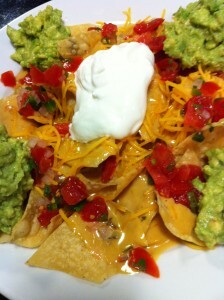 Sprinkle with some additional chopped cilantro, and serve with warmed tortilla chips. Variations: How much heat in the dish is based upon the amount of chile and seeds. Even a few seeds will add more heat and spice. 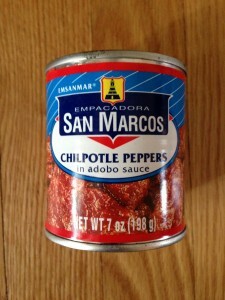 For less spice, you can omit one of the chipotle chiles and replace it with a spoonful of their adobo sauce from the can. Use fat free cream cheese. Substitute fresh parsley for the fresh cilantro if anyone is adverse to cilantro. And if you prefer the taste and consistency of a traditional cheese sauce, you can substitute a white sauce with shredded sharp cheddar and Monterey Jack cheeses instead of using the cream cheese. 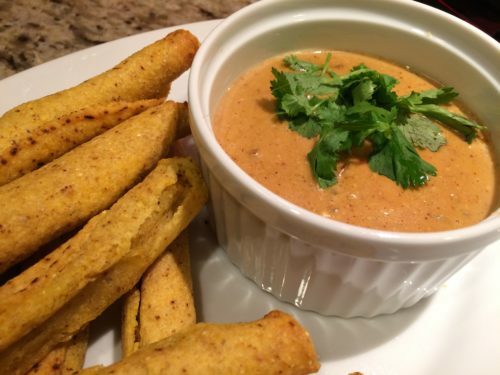 Also, this chile con queso dip works equally well as a sauce on chicken or beef enchiladas (thin queso with milk for a velvety enchilada sauce).